Welcome to the first edition of Brazilian Beer of the Week, although the title is a little misleading since this week we’ll actually be looking at three. The reason for this is because last week, in my post about Brazilian beer, I mentioned that in botecos (the Brazilian equivalent of a pub) the most predominant beers are Pilseners, with the most popular being the Skol, Brahma and Antarctica macrobrews. Typically, these beers are served as cold as possible as their purpose is to refresh rather than to taste, although, quite frankly, there’s not usually much to taste anyway. However, blandness doesn’t necessarily characterise all ‘boteco’ beers, with a few serving as decent (relatively) alternatives. Like their cheaper cousins they’re also macrobrews, but usually cost a little more and are available less frequently, although in most instances you’ll likely to find at least one of them. Where purchased: Most botecos I’ve visited in Brazil. Background: Original dates back to 1906 and is the child of Henry Thielen, a German migrant who made beer using brewing equipment that he had brought from his homeland to Brazil. Subsequently, Thielen founded a a brewery in Parana called Adriatic, of which Original was the showcase beer. 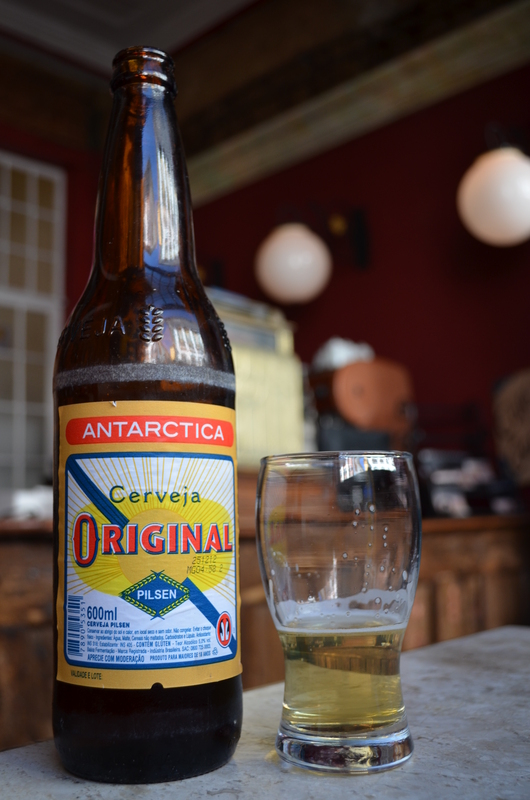 In 1943, the Thielen family sold the brewery to Antarctica Paulista, whereby production moved to São Paulo. In 1999 Antarctica was itself bought by AmBev, which then later became part of the Anheuser-InBev behemoth. Like the ‘big five’, Original doesn’t really do justice to its Pilsener tag, seeing as it lacks the distinctive hoppy / bitter taste that you might ordinarily expect. In other words it’s pretty bland, although less so than Skol, Brahma, etc. It’s pretty clear in colour and one positive is that it is much lighter than you might expect from a 5% beer, so if you’re on a night out (and it’s going to be a long one) Original should be your beer of choice. Aside from the beer itself, Original has one of the coolest beer labels around. Pretty much unchanged from the original, its simplicity and authenticity make a change from the crappy gimmick labels increasingly produced by new breweries. the book is on the table’s Rating: Not amazing, but better than the usual suspects. A standard lager / good session beer. Where purchased: Many, but not all, botecos. 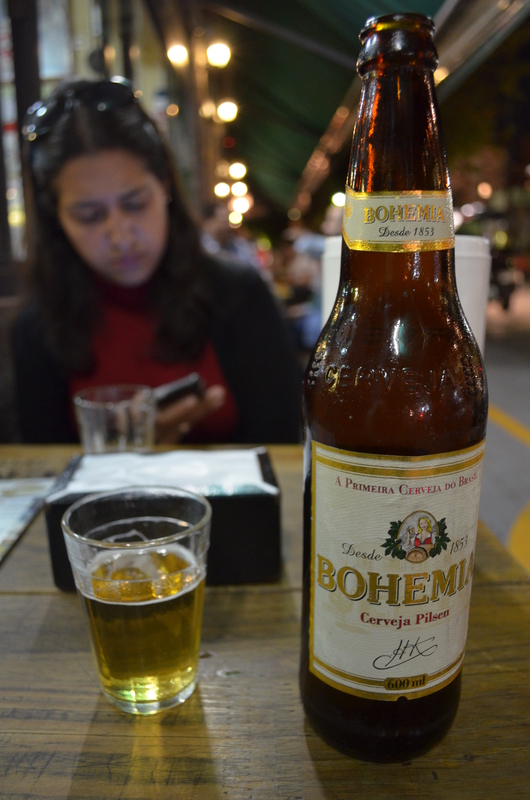 Bohemia dates back to 1853, when brewery was opened in Petropolis (Rio de Janeiro) by a German artist called Henry Kremer. The company later passed between his heirs and eventually became known as the Bohemia Brewery Company, of which Bohemia was its premium. During this time production was limited to around 6,000 bottles per month. Bohemia was also acquired by Antarctica Paulista (in 1960), which, as we saw above, later became part of the Anheuser-InBev. Bohemia origianlly imitated traditional German-style Pilseners (bitter and strong), but it gradually changed to accomodate the tastes of the Brazilian market – in other words it started to be served as cold as possible and brewed to be lighter and smoother (i.e. watery and bland). Similar to Original it has a taste of something, but not much. the book is on the table Rating: Like Original it’s a good alternative when there are no other options. Where purchased: Some, but not all, botecos. The Cervejaria e Maltaria da Serra company was founded in 1953 in Rio Grande do Sul, and it initially focused on the malting industry. However, it quickly became one of the largest malting companies in the region and in 1957 it released its first beer – Serramalte. In 1980 the company was acquired by Antarctica… and we already know the rest of that story. 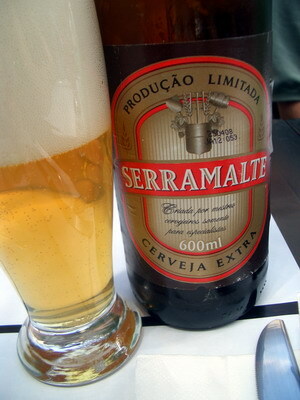 Serramalte is the best of the ‘boteco’ beers, mainly because it is one of the few to actually taste of something. Slightly darker than most Brazilian Pilseners, it is tastes a little bitter and even has hint of hops – hoorah! Unlike Original, Serramalte definitely feels like +5% beer, something your headache will attest to in the morning. the book is on the table Rating: The best ‘boteco’ Pilsener. A session beer – for masochists. ← Brazilian Beer: The coldest drink known to mankind. Good call – Original and Bohemia are the best of the bad bunch that are usually available. I’ve never seen Serramalte, but will now keep an eye out for it. Also, totally agree about the Original label – I love it! Serramalte isn’t so common in Rio I don’t think. You get it mainly in the South (where it’s originally from) and here in SP, but only in botecos. As far as I’m aware it’s not sold in supermarkets here – well, not any I’ve been to anyway! I more or less agree with what you said. I always try to drink Original or Bohemia when I’m in Brazil but to be honest I can’t remember the last time I had Serramalte (if I had it at all). I also like Xingu but that’s a different beer for another day, I’m sure. BTW, I thought that AmBev was actually the resulting company of the Antarctica and Brahma merger. Yep, Ambev was the result of that merger but was itself bought out as well – becoming Anheuser-Busch InBev. My understanding is that AmBev also merged with InterBrew to create InBev who then went on to take over Anheuser-Busch. Not that it matters but I think it’s nice to see a Brazilian company (at least originally) with such a footprint on the global market. You don’t see that very often. Yeah there were a whole load of mergers / takeovers – the kind of info that goes straight over my head. Nevertheless, it’s good to see Brazil leading the way – even if the beer is a bit pants! I recommend you to visit Belo Horizonte and its botecos. The state of Minas Gerais was called THE BRAZILIAN BELGIUM for its dozens of microbreweries. Hey Michel, I visited Belo Horizonte and Minas (Ouro Preto, São Joao de Rei, Tiradentes, Inhotim) last July. I really like Minas, however I didn’t realise the state was also a big brewer of beer (well, I do now!). Thanks for the link, I’ll check it out! My favorite Brazilian beer is Caracu (http://cerveja.inf.br/cerveja-caracu/). Amazingly dark for a Brazilian beer, I can almost pretend that it´s a Guiness (I´m sure Tom would beg to differ). Not having been in many botecos–since the ones in our tiny town are pretty sketch–I can´t say whether or not you´d find it there but I see it in many distribudoras and supermarkets here in Minas. I saw that in a supermarket the other day and now you’ve recommended it as well I’ve added it to my list! I found Caracu in my local supermarket yesterday. Hmmm, it’s a little sweet for me. Not a malzbier but not far off! lately i’ve been drinking in this order —> serra malte, original, skol. i recomend you to try cerpa, but the regular one! Cerpa, not heard of that but I’ll add it to my list. Cheers! Cerpa is from Pará (name comes from Cervejaria Pará or something like that). It’s very common in Belém and Santarém, sometimes you’ll find it in São Paulo and Rio, but not very often. It’s a nice pilsner. I had one in Recife called Nobel that I haven’t seen anywhere else, it was another decent pilsner. cheers for your beer guide. I live in Porto Alegre, we’ve had many good microbrews pop up lately, Seasons being perhaps the best of the bunch. Of the more widely available quaffs, I recommend Bierland, you should find it in some places in São Paulo. Their Imperial Stout is quite excellent, for someone who misses that sort of beer. A lot of good beer seems to come from the south and I guess a big part of that is the European heritage in that part of the country. I visited Blumenau and Porto Alegre earlier this year and loved trying all the beers there. I had a Pale Ale by Bierland last week and really liked it. It wasn’t too pricey either, I’ll keep an eye out for the stout (although if I’m honest I’m not a huge stout fan). Anyway, cheers for reading and taking the time to comment ! What about cachaça? Do you like it? Cachaça? Only in a caiprinhha. Lethal!